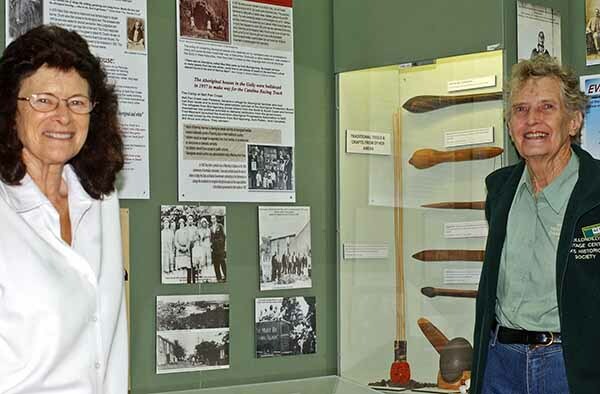 Tucked away in The Oaks is a treasure that most people know and others are delighted to find – it’s a trove of artefacts, facts and glimpses of the past, which can all be found at the Wollondilly Heritage Centre and Museum – which showcases history as well as reliving it. The centre and museum tell the unique stories of the people and places of Wollondilly and the Burragorang Valley. Before the Burragorang was flooded to allow water to flow into the Warragamba; it was a thriving village – a community complete with shops, a church and school –many of which were salvaged. But some of the oldest items proudly on display are Aboriginal sharpening tools which date back many generations. The museum also highlights the indigenous people of the area, early settlement, the Estonian migration as well as the mining history and other stories. President of the Wollondilly Heritage Centre and Museum, Trish Hill and volunteer and historian Betty Villy with some of the features of the museum. Trish Hill president of the heritage centre which was built in 1988 as part of the bicentenary said it is popular as a research centre, even for indigenous researchers keen on tracing their family history. For the younger generation it’s an opportunity to get hands on experience of what life was like before electricity and the mod-cons of the 20th century. “It’s hard for children to imagine there was life without power,” Ms Hill said. That’s when they are introduced to the washboard, butter churner, the wood burning stove, hand-made farming implements – but what’s more fascinating is the old school room which was used between 1887 and 1809 in Lakesland – the youngsters would write their lessons on slate boards (small blackboards) and sit at wooden desks with ink wells. The cane was dominant behind the teacher’s desk. Ms Hill said there’s lots to see and while other museums have all their displays under one roof, the centre has several buildings people can walk through. For the older generations there are also lots of things to make them smile, chuckle and even grimace when they walk through the displays – such as the one room Burragorang cottage complete with a tub by the stove, bed pots (no inside toilets in the old good days) and only curtains for privacy. “The cottage was dismantled from Monks Lane at Mount Hunter and rebuilt; it’s a good example of how modest living conditions were for many,” Ms Hill said. She added many of the farming implements were from the Estonian farmers who settled in Wollondilly many decades ago. As much as the focus is on history, the museum also looks at the immediate past and recently a reunion was held by the former coal truck drivers. The heritage centre which was built on council owned land is largely self-sufficient and charges a small admission fee to help in the upkeep and displays. It has an army of volunteers the oldest 85 years – who are all passionate about preserving and sharing history. Ms Hill said a lot of thought goes into the exhibition and displays along with the number of tours the volunteers conduct every week. The centre and museum is open every weekend 10am-4pm and is located 43 Edward Street, The Oaks. To find out more call 4657 1224.